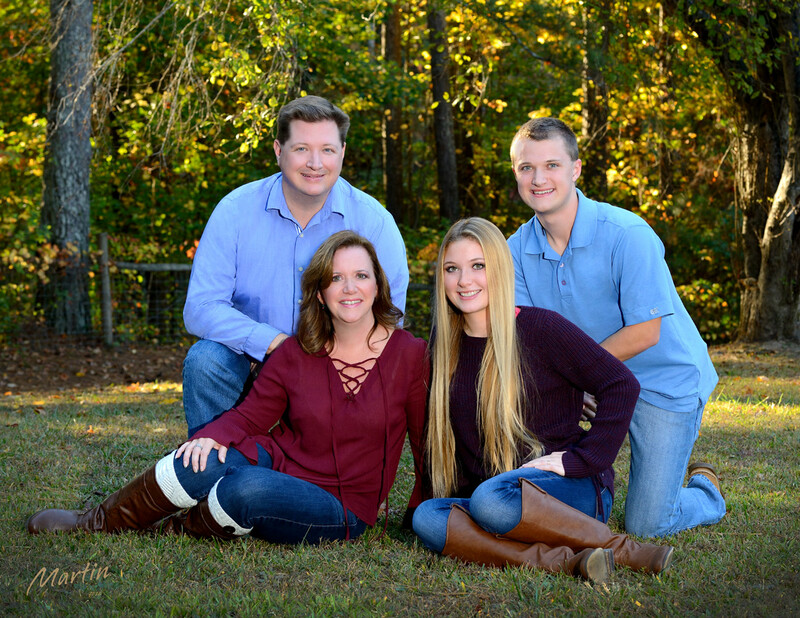 This past fall I had the joy of creating a family portrait for the Young family at Suwanee’s Sims Lake Park. We had a blast – and we came away with some great family portraits. Whenever I work with a family, whether it’s in our Lawrenceville portrait studio or out at a beautiful location like this, we always make several different poses of the whole family as well as individual and small group portraits. While we have everyone together and dressed nicely it’s a good thing to do. My portraits are planned! I carefully select portrait locations for backgrounds as well as for proper lighting to flatter the subjects. While many photographers today are using just sunlight and calling it “natural light”, my lighting style is “light that looks natural”. I carry studio lights, battery packs, reflectors and other photographer “toys” to create light that totally flatters the folks in the portrait as well as blending with the environment. Good lighting doesn’t just happen – it has to be planned an shaped to totally flatter the subjects in a portrait. We pose! Seldom to people just naturally fall into a flattering pose for a portrait – they just need a little coaching. We turn, tilt, hug, squeeze and love on each other to get a great look. We work toward creating a wall portrait that shows off your good-looking family as well as the relationships and individuals that make up your special bunch. It takes a little effort – but it’s always worth the work! Our family portrait packages include the session, a beautiful canvas wall portrait, and desk sized prints too. Printing and displaying is the best way to enjoy a family portrait – but we’ll include digital files for social media too! Call today to schedule a family portrait in the studio or a local park! Do it today – you’ll be glad you did.